I am a big fan of chocolate cups. These cookie butter cups are my latest creation. I also have some pumpkin chocolate cups and some copycat Reese’s cups on the blog. 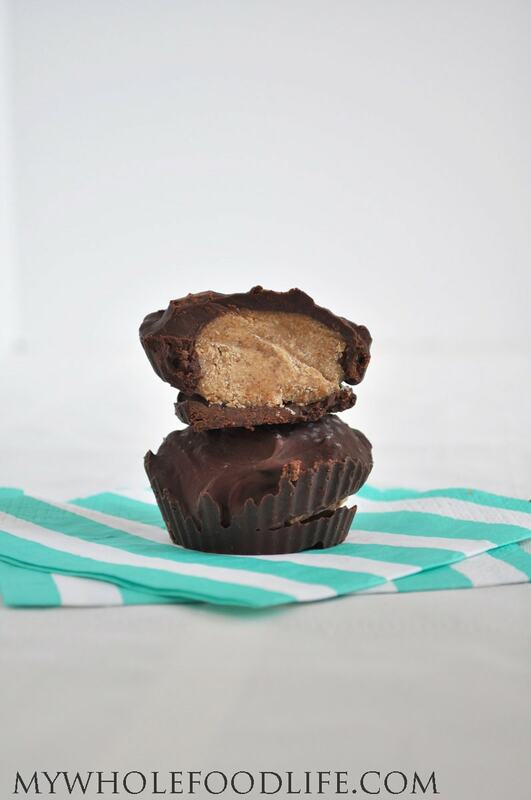 I used my homemade cookie butter to fill these cookie butter chocolate cups, but you can also use the store bought cookie butter too. I used chocolate chips for the chocolate coating, but I am guess my 3 ingredient chocolate recipe could be used as well. This yummy chocolate dessert is vegan, gluten free and paleo. It’s also very easy to make. I made mine in standard sized muffin cups, but I think making mini cups would be great too. Then you could use them as an ice cream topping. 🙂 The gingerbread-like flavors of the cookie butter go so well with the chocolate. Fill a medium sized saucepan with water and bring to a boil. Place a glass bowl on top of the the sauce pan. Add the chocolate chips and the almond milk to the glass bowl. Stir constantly until the chocolate has melted. Line a muffin pan with liners. I used silicone liners . They work great for this. Once the chocolate has melted, spoon a little into the bottom of each muffin cup. Place the muffin pan in the freezer to firm up a little. About 5 minutes. Once the bottom layer of chocolate has firmed up a bit, place a spoonful of cookie butter on top. I used my hand to kind of flatten it out. Once all the muffin cups have cookie butter in them, fill the remainder of them with chocolate and stick back in the fridge for an hour to firm up. Once the chocolate has set, you can store these in the fridge or freezer. However, if you keep these stored in the freezer, I highly recommend pulling one out about 5 minutes before you eat them so the cookie butter can soften a bit. Enjoy! what kind of almond milk do you recommend? I noticed alot of almond milks out there have questionable ingredients. I make my own, but if you need a store bought recommendation, I would suggest Silk. It's non GMO verified and carrageenan free. Oh my these look divine. I have yet to have breakfast and I am tempted to make a bath of these! Thanks Kezia! They are so good! I think about 1 week. They will last much longer in the freezer though!